In the age of Google, searching has become one of the main activities and focuses for just about anyone that is connected to the Internet, via a computer, a tablet, or smartphone. But what about searching for things on your computer system? I’ve been using Windows 7 (and Vista before that without any glaring problems) on my main graphics workstation/computer systems for years now. 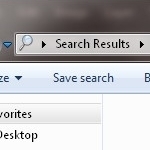 The search function built into Windows 7 in particular has been one of the joys and useful tools of my computing experience, something that I recently discovered isn’t the norm. So we’ve all done it. You’ve slaved over a graphic, rendered the text, altered the video spending countless hours to create virtual perfection – and you have no idea where you saved it. While the “recent documents” listing in the app sometimes helps out, the fact remains is that you’ve got to “find” the file before you can submit it to the client and hit your deadline. I click on the Windows-logo’d sphere on the bottom left hand corner of my laptop’s display. Instantly, I’m greeted with a form field (that gleefully showcases a light grey “Search Programs and Files”). Since my start in the early 90’s as a graphic designer, I’ve been using the same naming convention on each project I begin. I’ll always use the name of the project, how it fits into the project, and what incarnation it is. Each segent is separated by a dash. 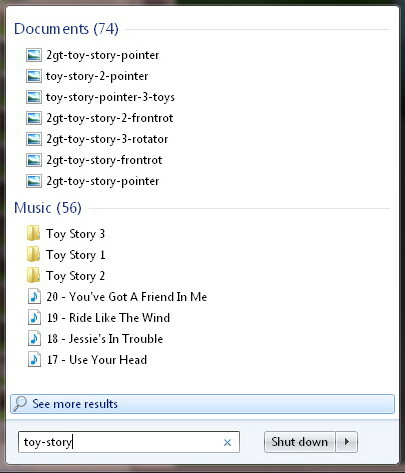 Sample: toy-story-podcast-ad-sprint-3.psd. Ask Dave Taylor windows 7 search. permalink.